In keeping with our journey around DevOps @MagenTys, today I wish to focus on DevOps tools. It’s not the first time that someone has come to me with the same problem, they want to move their version control solutions from a source code version that was “imposed” some time ago, to something more modern, broadly accepted and that can easily integrate with their CI/CD pipelines. I came across a variety of teams with a range of control server versions, and despite what many may think, not everything out there is just Git and GitHub. There were teams using TFVC moving to Git, others deep into Perforce moving to SVN, even some with Visual SourceSafe (still!) migrating to Assembla Git! The most common of all were teams moving from the above to Git or from Git to GitHub or Bitbucket. From the Atlassian suite, Bitbucket comes as a distributed version control system based on Git. Very well-known for its full integration with other products in the Atlassian family such as Jira, Fisheye and Bamboo.The advantage Bitbucket holds over its competitors is that Bitbucket offers unlimited number of private repos. Payments are made on a monthly subscription basis and currently, there is no option for annual subscriptions on Bitbucket Cloud. At MagenTys we have implemented both options many times, and I have to say that is a very good option if you know how to optimize your Cloud resources properly, as it’s not only about installing in in a VM with the right access and network properties, but things like the cloud storage accounts can be monitored and optimized properly to save space or transactions and similar with the VMs usage, as you should be tweaking again and again these machines until they have their optimal resources usage according to your team habits. The hosted options look very attractive for both Github and Bitbucket, integrating with Jira and Jenkins indistinctly. It is also much more affordable, also taking in consideration that if we want to host on our own servers we don’t have to pay for the licenses or for hosting the server in our own infrastructure or cloud. However, thinking about the size of the VM to support the server installation, the server and data redundancy, the 24/7 support and the scalability, makes me seriously doubt whether it would be the best choice… unless you have some constraints about where your IP needs to be hosted in. I hope this information is useful for you to decide which version control repository is more suitable for you and if you would like further advice and interested in moving your version control solutions to Bitbucket or Github, speak to us today. And remember, DevOps is not a tool, its not a guide, its not a methodology, it’s a Journey. The main purpose of this post is to share with you the main resources that will drive you through the journey of DevOps, but first, a quick intro to DevOps. DevOps (a clipped compound of “development” and “operations”) is a software development method that emphasizes the roles of both software developers and other information-technology (IT) professionals. 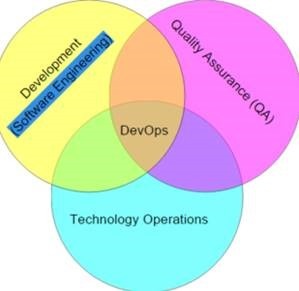 What we can basically describe in a diagram showing how QA, Developers and Operations are part of DevOps. So, DevOps is more than a technology or a tool set. It’s a mindset that requires cultural evolution. It is people, process and the right tools to make your application lifecycle faster and more predictable. Practicing DevOps can help teams respond faster together to competitive pressures by replacing error prone manual processes with automation for improved traceability and repeatable workflows. Organisations can also manage environments more efficiently and enable cost savings with a combination of on-premises and cloud resources, as well as tightly integrated open source tooling. Careful selection of the right toolset will minimize risk and facilitate much needed self-service of resources while at the same time reduce security risks across hybrid environments. Improvement of quality practices helps to identify defects early in the development cycle, which reduces the cost of fixing them.Rich data obtained through effective instrumentation provides insight into performance issues and user behaviour to guide future priorities and investments. A wide set of tools and services from Microsoft and others enable these (DevOps) practices on-premises and in the cloud. DevOps should be considered a journey, not a destination. It should be implemented incrementally through appropriately scoped projects, from which to demonstrate success, learn, and evolve. DevOps is not just about the tools and the tech. It’s also about the importance of transparency, communication and collaboration between development and operations teams, it’s about the inclusion of the project’s business owner and other critical groups such as security, networking, compliance in the discussion. To learn more about the whole process, visit Microsoft Virtual Academy’s DevOps section. DevOps is a journey, not a destination. Get yourself ready, and be on your way to success. So now that you know more about DevOps, what does Microsoft have to offer you? Training: A bunch of very good online trainings provided by Microsoft Virtual Academy. I hope this resources are useful for you as they were for me. Today I’m running a new event in Central London and covering one of the topics of the year, Team Collaboration with Visual Studio Online. For those that don’t know what Visual Studio Online is, just say that it’s not an IDE, it’s everything else. Visual Studio Online provides a set of cloud-powered collaboration tools that work with your existing IDE or editor, so your team can work effectively on software projects of all shapes and sizes. Yes, of course it gives you version control (git or TFVC) but also Tools for agile teams such as Kanban, Scrum templates and Dashboards. It provides you powerful services like the new continuous integration system that allows you to build, validate and deploy into the a hybrid cloud and that offers an open and extensible integration with other platforms. In this session we will go through the Microsoft latest ALM Collaboration tools, covering how to plan and track work in an agile environment. This will be shown using one of the three templates that Microsoft provides for project management, Scrum, and we will see how to customize your Kanban boards, create dashboards and reports for anyone in the team (not only dev and test people). As Visual Studio Online is a Microsoft Cloud Service that is evolving every month, we will see also what’s just came new into VSO this year. Anyone with a keen interest on Project Management, Work Item Tracking, Capacity Management, Agile Frameworks. Also BA, Devs, Testers and Ops that want to work in an Agile environment with a Continuous Integration and Continuous Delivery cadence. – Collaboration between Management, Dev, Test and Ops. – Integration with Excel, Visual Studio, MTM and Trello. Come along to Moorgate on Thursday 24th September 2015 where Eduardo Ortega, ex former Microsoft Evangelist, MVP and MCSD ALM professional, will be discussing Visual Studio Online and Team Foundation Server as ALM Tools. A colleague from recently asked me about when should we use Load and Performance Tests? Well my answer would be: “All the time during the product development”, but there are specific stages where this is critical. Some agile teams have a verification week before moving to the next iteration. During verification week, they spend first 2-3 days of the week verifying the product in their test environments. If everything is okay, by Thursday they deploy to preproduction environment. Once they have green light in pre-production, they deploy to production, which is targeted over the weekend or Monday morning. So the tests that they run during this verification week are the same they run continuously in their working branch. Load testing is a critical part of our software development process. We find many serious issues in load testing, everything from performance regressions, deadlocks and other timing-related bugs, to memory leaks that can’t be effectively found with functional tests. Load testing is critical to being able to confidently deploy. TFS has web service end points, rest end points and web front ends. In order to generate the massive loads we need, we use Web tests to drive load to our web site and web pages, and unit tests to drive load to our web services. Here a representation of the Load Tests Script Architecture. All tests scripts use common configuration to determine which TFS instance to target in the test, and scripts can be configured to target an on-premises server or Visual Studio Online. Performance Regression Testing: executed every sprint to ensure that no performance or scale regressions are introduced. We run a load tests while the upgrade is happening, so, as activity is constantly going against the service, we can detect outages through all the stages. Stage 1: Deploy new binaries into web front ends and job agents. Stage 2: Run jobs to upgrade the databases. Stage 3: Run jobs to do necessary modifications of the data stored in the databases. Isolate a particular component or service for performance, stress and scale testing. PerfView analysis: mainly driven by a tool called PerfView. Useful for finding memory and CPU regressions in production. As you see, running performance and load tests is something that could be done anytime, but depends on the time where you do it, it will involve different techniques and data to capture. I encourage you to create your first Web Performance and Load Tests following some of the next links and find yourself the answer of… When and Why to run Web Performance and Load Tests. While running the Certified Scrum Developer Training at London, we went through an amazing journey across TDD and BDD techniques using C# as a main programming languages. For some of us, it was a good practice that helped us to refresh our rusty programming skills, for others was a way to move a Tester role to a Software Developer Engineer in Testing role. Let me share with all of you some useful resources about C# programming that will make your journey on programming even more interesting. I recommend to download the Community Edition as it’s totally free and fulfil most of the needs you have about Coding. I hope this info is useful and enjoy coding!